While on a routine Eco-Watch flight above northern Canada to study one of the most powerful solar flares in history, Donovan Nash and Michael Ross narrowly miss colliding with another aircraft a Boeing 737 that's not supposed to be there. With the mysterious 737 trailing smoke, Donovan and Michael watch as the stricken aircraft makes an emergency landing on a frozen lake. As the Boeing breaks through the ice and begins to sink, a figure escapes into the frigid water and manages to climb up onto the ice. Donovan reaches the lone survivor and discovers it's a young woman. Just before she blacks out, she whispers a dire warning, "Don't let them know I'm alive--they'll kill everyone." 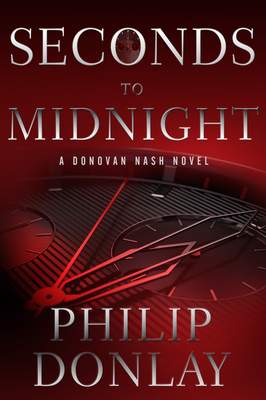 Seconds to Midnight plunges Donovan Nash and the Eco-Watch team into a fight for their lives. While Donovan searches for answers at the bottom of a frozen lake in Canada, his wife, Lauren, runs from operatives embedded in the top levels of the Russian government. With communication in the Northern Hemisphere crippled by the massive solar storm, Donovan, Michael, and Lauren battle for each second, as the clock ticks toward a possible Armageddon.